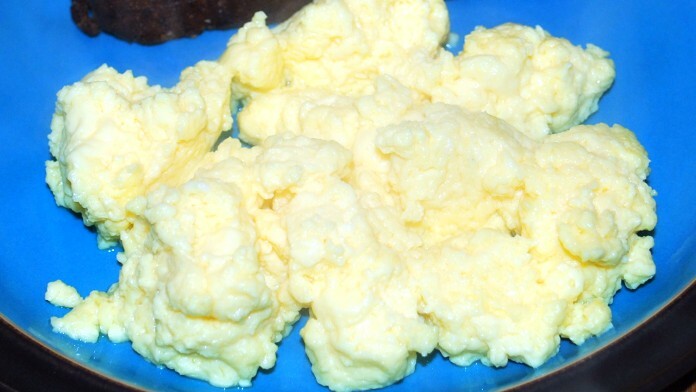 The fluffiest, most perfect homemade scrambled eggs you can ever make come out of a blender. No kidding! Heat small pan on the stove at medium-low to medium. Add milk to blender. Crack eggs into blender (avoiding shells, though if you accidentally get a little bit in there, you have extra calcium). Add garlic powder to taste. Add sea salt. Adjust these ingredients to your liking. Start blending at low speed. The goal is to mix the two fluids evenly. Because the ingredients are primarily liquid, you run the risk of splashing out of the mixing area unless you start slow. Increase gradually to a speed of 3 or 4 for 20 - 30 seconds. The longer you blend, the more air you'll mix into the eggs. Air makes them fluffier, but overblending will make a frothy mess that cooks too quickly. Pour into pan and cook as normal. Spatula technique is important: use a teflon spatula to churn eggs constantly to avoid overcooking. Your eggs should cook within three minutes. You may substitute water for milk, to make the eggs thinner while avoiding dairy. Blend for slightly less time in this case. If you're going to add pepper, add it at the end of the process. Similarly, add shredded cheese after you've finished cooking.